Having set up an run for the past 10 years a leading Brussels-based observatory of EU politics, Doru Frantescu, CEO and Co-founder of VoteWatch Europe, shares his insights in this Springer’s book, Lobbying in the European Union. The volume is coordinated by Doris Dialer and Margarethe Richter and combines insights from a broad range of practitioners and academia. The chapter which Frantescu co-authors digs into the channels that we can expect the UK to use in order to defend British interests in Brussels after its own officials leave the European Parliament and the Council. 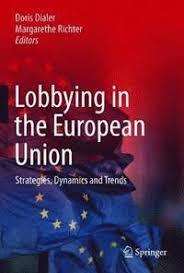 Drawing on the first-hand professional experience of lobbyists, policymakers, and corporate and institutional stakeholders, combined with a sound academic foundation, this research offers insights into successful lobbying strategies, such as how alliances are formed by interest groups in Brussels. The authors present key case studies, e.g. on the shelved EU-US trade deal Transatlantic Trade and Investment Partnership (TTIP), lobbying scandals, and the role of specific interest groups and EU Think-Tanks. Furthermore, they highlight efforts to improve transparency and ethical standards in EU decision-making, while also underscoring the benefits of lobbying in the context of decision-making. Doru Frantescu signs the chapter on British Interest Representation in the European Union after Brexit, together with Andrei Goldis, making an X-ray of the channels that the British stakeholders – both public and private – are likely to use in order to promote their interests and messages among their former EU colleagues. Being divided in three sections, the chapter consists of an assessment of the degree of influence exerted by the UK in EU institutions until Brexit, followed by an examination of the best partners of the UK in the Council and the European Parliament and concludes with an analysis of the likely impact of Brexit on the direction of key EU policies. The book can be ordered in both formats, E-book and hardcover, by accessing the following link.